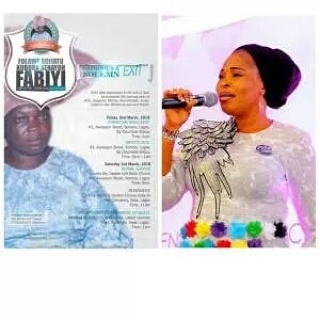 Dash Media Celebrity gist Entertainment Tope Alabi Yomi Fabiyi Nollywood star, Yomi Fabiyi to bury MUM!!.. Nollywood star, Yomi Fabiyi to bury MUM!!.. All is set for the final burial of Madam Folawe Kubrat Fabiyi, mother of notable nollywood actor and movie producer, Yomi Fabiyi, who died some days ago. According to report, the burial rites begins with Christian wake keep on 2nd March, 2018 at 43 Awoseyin Street, Somolu, Lagos, by 4pm and artiste night will hold same day, same place from 8pm till 1am. On the 3rd March, 2018, the song of service will hold for the departed soul at ‘Deeper Life Bible Church’, 43 Arowoseyin Street, Somolu, Lagos while the remains of Madam Folawe will convey to Atan Cemetery by Ebony Vault where she would be buried. The reception where popular music act, Evangelist Tope Alabi and Busola Eleyele would dazzled hold at Blueroof, LTV Premises, Agidingbi,Ikeja,Lagos. 0 Comment to "Nollywood star, Yomi Fabiyi to bury MUM!!.."